Should climate hawks really worry about rising domestic fossil fuel production? 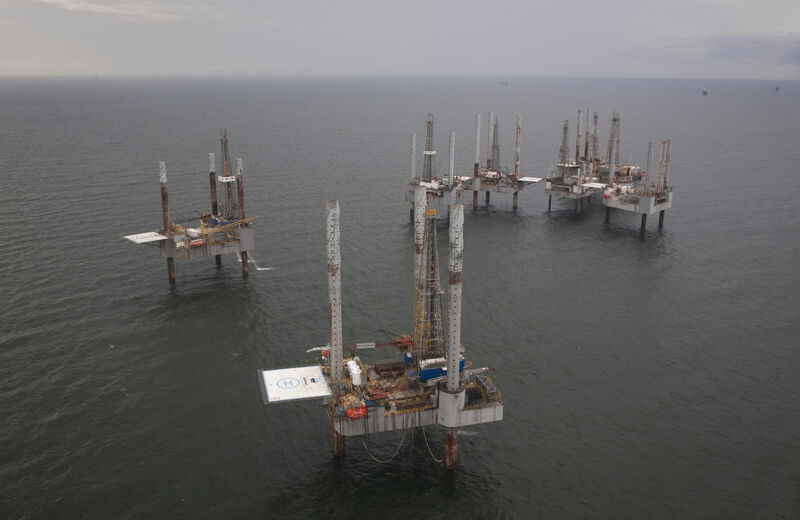 The Obama administration recommended on Thursday that private companies begin searching for oil and gas reserves off the Atlantic Coast, an area that has been closed to drilling for decades. More than 3 billion barrels of recoverable oil and 312 trillion cubic feet of natural gas may lie in the area, which extends from Delaware to Cape Canaveral, Florida. Oil and gas companies have lobbied administrations since the 1980s to lease ocean tracts in the Atlantic, to little effect. The release of an environmental impact study by the Interior Department that concluded undersea seismic testing could commence is a step toward doing so, although it can’t happen before 2017; the current five-year plan for the Outer Continental Shelf keeps the Atlantic out of bounds. Oil industry groups, along with a coalition of governors from coastal states, are hoping to influence the next five-year plan as it develops, a staffer who has worked on offshore issues for Alaskan governor Sean Parnell told me on background. Practically, they’re hoping to find new reserves: nine companies have already applied for surveying permits, according to The New York Times. “It would be really ironic if the Obama administration, which supposedly understands climate change and thus the need to keep fossil fuels in the ground, was the one to open these areas,” said Steve Kretzman, the executive director of Oil Change International. The president previously green-lighted exploratory activity in the Atlantic three years ago, but scuttled the plans after the Deepwater Horizon exploded in the Gulf of Mexico in April of 2010. The prospect of new activity in the Atlantic, even if years or decades away, raises a question that environmentalists have found themselves asking often lately: How does the administration reconcile its commitment to fighting climate change with its long standing support for expanded oil production? Obama’s approach to climate is largely focused on reducing demand for fossil fuels, by promoting investment in renewables and tightening emissions standards for power plants and motor vehicles. (If Congress could ever put a price on carbon, that also would affect demand.) The implicit assumption of Obama’s “all of the above” energy strategy is that policies intended to discourage consumption will be effective even if fossil fuels become more readily available. By this logic, the United States might as well reap the profits from our fossil fuel reserves so long as demand exists—until people don’t need oil and coal, someone will continue to supply it. Some of the profits from domestic oil production could even help power the transition to cleaner energy if they were funneled into a research and development fund for renewables. So why have climate hawks focused lately on cutting off the flow of carbon-intensive fuels? For example, the major environmental fight right now, over Keystone XL, is about keeping tar sands oil in the ground. Part of the answer is that policymaking and activism have different goals, as David Roberts has argued. Even if the most effective practical way to lower carbon emissions is to stop consuming so many fossil fuels, effective activism may depend on picking different fights. It’s not either/or. We have to work on both the supply and demand sides of the oil and gas equation. As the supply of oil and gas goes up, the cost the market perceives for it is going down, thus encouraging more consumption—which is exactly the signal the climate demands that we do not send. If we had a perfect market for energy, working on the demand side alone might do it. But we’re not remotely close to that. Oil is controlled globally by a cartel, heavily subsidized by taxpayers around the world, and insulated from paying various substantial costs such as health, pollution clean-up, military support, and of course the social cost of carbon. These industries are based on, and profit from, finding more and more of something that science says we have more than enough of. Every additional field is a step in the wrong direction. It has to start stopping somewhere. What’s particularly important here is the connection drawn between increased production and the political power of the petrochemical industry. This is an industry that has every interest in blocking climate change legislation; to that end, it has poured millions into shoddy research in an attempt to discredit climate science, and its political donations prop up the lawmakers who trot out the same hack work to justify obstructing legislative action. It’s true that Obama can’t do anything unilaterally that truly meets the scale of the crisis. In order for comprehensive policies aimed at cutting consumption to pass, we need a different political climate, one that’s not dominated by fossil fuel interests. Giving those interests greater access to public resources is a poor way to change the status quo.